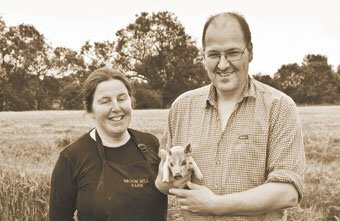 In 1989 Matthew and Tracy Betney moved to Broom Mill Farm with the intention of developing the farm - and didn't they do that! Since then they have built a Farm Shop, Tearoom, Bakery, developed their own range of delicious deli goods, and all the while maintaining the Broom Mill Farm ethos of providing customers with traditionally prepared cuts of meat and meat products, second to none in taste and quality. All of the farm produce has full traceability - this means that on the farm Matthew and Tracy grow and produce their own feed, aswell as breeding and rearing their own animals. Therefore Broom Mill Farm can proudly inform all customers that they have complete confidence in the welfare, nutrition and quality of their stock. As the Betneys grow their own corn, mix their own animal feeds and only they look after their animals they are in the very unique position of being able to tell the WHOLE story of their products - from start to finish with no artificial additions. At Broom Mill Farm our pigs are homebred. They are reared both outside and in open straw barns where they are managed in a very welfare friendly environment which aims to have happy, healthy pigs! Our Pigs are fed on our own special cereal feed which we mix ourselves. This is so that we can use only the best ingredients and so we know exactly what our pigs are eating. There are no antibiotics or growth promoters used in our feed. All this ensures that our products and meats tastes like They used to Taste. Broom Mill Farm is not only a working farm but also Farm Shop, Tea Room, Delicatessen and Bakery located at the foot of the overlooking and magnificent tree-lined Bildershaw escarpment and in the heart of beautiful Northumbria's Durham countryside in Lower Teesdale, near West Auckland and Bishop Auckland in Weardale and Wear Valley. As the name suggests, there was a mill at the farm some centuries ago in 1691 in the days of water-power. In fact, the old mill house is still attached to the farmhouse and is now part of the Farm Shop.